LG WM2350HWC Front-Loading Washing Machine, 4.2 cu. ft. The extra large 4.3 cubic feet capacity of this Energy Star-compliant washing machine accommodates more clothes in one load. Its SenseClean System decides on the required water level based on the weight of the load. All of the washer’s 9 wash programs use the innovative 6Motion Technology. The wash programs include the bacteria-killing Sanitary cycle and a special cycle to simulate hand washing. The washer also features basic wash cycles such as Cotton/Normal, Bulky/Large, Perm Press, Delicates Speed Wash and Drain + Spin. Its 10 options consist of ColdWash, WaterPlus, Extra Rinse and more. The washer’s SenseClean System provides the necessary amount of water based on the volume and weight of the laundry, while the 4-tray automatic dispenser puts in the appropriate amount of detergent, bleach or fabric softener at the right time. TilTub wash basket has an extra large capacity of 4.3 cubic feet. It can hold up to 10 kilograms of dry laundry, making it possible to load a greater number of clothes in one washing. It is made of rust-proof NeveRust Stainless Steel and to reduce excessive vibration and noise, the tub is equipped with the LoDecibel Quiet Operation Technology and TrueBalance Anti-Vibration System. The plastic Dial-A-Cycle control board is placed at the washer’s front to make it more accessible. The controls consist of one-touch buttons, electronic knobs and an LED display which shows the cycle’s status and estimated remaining time. Installation Options It can be built-in under the counter or inside a cabinet, stacked with a matching dryer to save floor space, or used as a freestanding unit. A drawer pedestal is available to elevate the unit. The unit’s large, rounded door is made of sturdy transparent glass with chrome frame. To keep the washer rust-free, its top plate and body are fabricated from rust-proof painted steel material. This model is available in White and Wild Cherry Red. 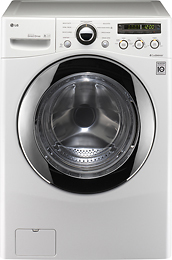 The 6Motion technology of this unit features the use of 6 wash motions in all of its cycles, claiming to wash clothes more efficiently but with care. The washer’s SenseClean System helps in saving on water bill since the system regulates the amount of water needed in each wash.
To decrease excessive noise and vibration, the washing machine is equipped with the TrueBalance Anti-Vibration and LoDecibel systems. Bacteria and germs are eliminated by the washer’s NSF-certified Sanitary cycle. A steam cycle is not included in the washer’s 9 wash cycles. This unit is pricier than other washing machine models.